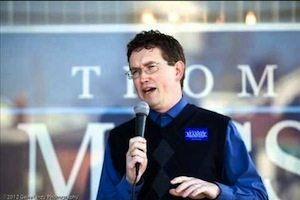 The votes have been tallied, and the winner of the Republican primary in Kentucky’s 4th congressional district is…Thomas Massie. Why should we care? Because Massie is the founder of SensAble Technologies, the venerable Boston-area firm that was recently acquired by Geomagic. He’s a well-known MIT grad in these parts. And he’s a prolific inventor in the field of touch-based computer interfaces. You can read about his fascinating story here. Massie is leading a charge to encourage more engineers and problem solvers to get into politics. We will be watching to see how he fares amongst all the pols—and whether more engineers end up following his lead. Mr. Huang, none of Massie’s magistrates own a store. It sure makes for a good corruption story though, lol!